Can a rock'n'roll tour go green? 'The little things add up to the big things,' says Mike Martin, who leads the team working to make The Joshua Tree Tour 2017 more environmentally friendly. Cathleen Falsani reports. Hey, hold on a second! Yes, you with the see-through plastic bag in your hand—the one that that Joshua Tree tour t-shirt came in when you bought it at the merch table during the show last night. That's right. It's 100 percent COMPOSTABLE. Compostable "merch" bags are among a number of initiatives aimed at reducing the environmental impact of The Joshua Tree 2017 tour. From macro-level efforts such as off-setting the overall CO2 emissions from tour transportation and inviting fans to take public transport or carpool to the concerts, to the nitty-gritty details such as asking venues to use paper rather than plastic straws, making sure trucks have their tires properly inflated, and providing vegetarian or vegan options at each meal for the nearly 200 staff and crew members who travel with the band on tour, the band are working with Live Nation to reduce and mitigate the environmental impact of touring a rock'n'roll show. "The little things add up to big things," said Michael Martin, founder and CEO of EFFECT Partners, the tour's official environmental advisor. "As one of the biggest music touring acts today, U2 has the ability to drive progress in the greening of touring. What they do inspires others and we hope the actions they have been taking on this tour, and their previous two tours, will help show other acts they can also go greener." Martin, who also has worked on global tours with Jack Johnson, Dave Matthews Band, and The Black Eyed Peas, among others, has been a pioneer in efforts to help the music industry reduce its environmental impact, introducing the "EnviroRider," carbon offsets, biodiesel, and a host of other sustainability innovations. Before 2009's U2360˚ Tour, Live Nation commissioned Martin to address three key areas of sustainability: touring production, venue operations, and raising awareness within the fan community. To that end, two full-time staff members were added to help build more green practices into the tour. The results were so promising that eight years later, when the band hit the road for The Joshua Tree Tour 2017, the greening initiatives of U2360˚ had helped the industry to start thinking differently. 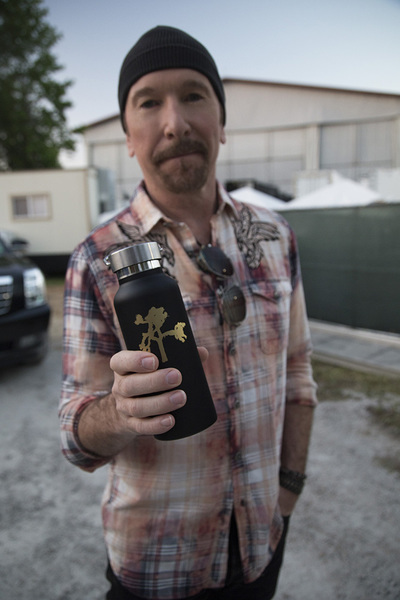 Members of U2's touring crew, for example, are provided with a reusable water bottle and encouraged to fill it at a Bevi water station backstage. "Producing these desert songs is thirsty work," reads a memo sent to the crew. "In fact, the average team member goes through about 5-10 plastic bottles of water a day. It's important to stay hydrated, but those plastic bottles are a heavy burden on the planet and your body." Whenever possible, venues are asked to allow concertgoers to use refillable water bottles and to provide clear signage for water stations, recycling, and (when it's an option) composting. Martin and his partners employ a strategic, scientific approach to reducing the tour's environmental impact by looking at four areas: waste, water, energy, and fan communications. "Where is there waste? Where could there be energy saving?" Martin said. "We quantify the things we can get our arms around." The Bevi™ water station, for instance, keeps track electronically of how much water is dispensed so Martin and his team can quantify how many plastic bottles have been saved during the tour. Similarly, when venues make waste disposal data available, they track it, compare it to other tours, and analyze the difference in waste output between venues with recycling and composting and those without. Other green efforts being incorporated into the Joshua Tree tour include the recycling of guitar strings (they're changed daily); using a hydrogen fuel cell vehicle in some markets; and plans to sell commemorative reusable beverage cups at venues. On transportation-related emissions, Martin and team catalogue the model number of every truck, bus, limo, and aircraft used throughout the tour to track meticulously the total mileage, which determines total CO2 emissions, which are then offset. All of the tour's offsets are validated and verified according to the Gold Standard, a global leader in carbon offset standards, ensuring they have the highest quality environmental and sustainable development benefits. "With CO2 emissions, first of all we try to reduce them, and then we offset what we can't," he said. "Surprisingly, the biggest aspect of any tour's environmental footprint is often fan travel," Martin said. So his team work with venues on fan communications, producing travel FAQs about public transportation, ride shares, and shuttles, and sometimes making bicycle racks and special parking for electric or hybrid cars available. When he began working with the band in 2009, Martin designed an offset that had never before been attempted: his team identified villages in the African rainforest—the Siaya and Bondo counties of Kenya—where villagers cut down trees for firewood in order to boil and purify drinking water. Following the tour, villagers were provided with water filters to purify their drinking water, something that improved quality of life for over 10,000 people and also protected the rainforest. "That became the offset for the 360° tour," Martin explained. "It was such a successful model that it's now being implemented in seven countries on three continents by other bands, non-profits, and corporations." For the Innocence + Experience tour in 2015, the team used the same model, this time in the Santrokofi community of Ghana. Villagers were provided with water filters again, but with a new twist: recipients pay about 25 cents apiece per month for the filters—an amount that is affordable for all and gives villagers ownership of the devices. The 25-cent payments are collected, aggregated, and 100 percent of the funds are used to buy food and other supplies for the Santrokofi community, Martin said. Stay tuned for the next evolution of this innovative offset model for the Joshua Tree 2017 Tour. "It used to be that greening was the exception, but after years of doing this work alongside other forward-looking bands, U2 is having a real impact on the industry," Martin said. "All along, they just have quietly done the right thing for the planet." Brilliant bit about using water filters to save trees! I love that you encourage and support these ideas! Sweet! I can't fathom not using a metal water bottle every day of my life, wherever I am, and to have your whole team doing it definitely makes a difference as does responsible transportation and all the other initiatives you are working on. I am always surprised how little people know about the difference our actions can make. Leading by example works wonders! Very proud of the crew of U2 who make this possible because all efforts help for a better environment. Way the go guys!! to promote the use of public transport it would be great if for example your concert ticket would be usable as a ticket for the tram, train, well any means of public transport. Some cities already do this but it would be great if this would be a general rule. Like that a lot of people leave either there car at home or park it outside the already congested cities . I can only imagine the break down of equipment. You guys the engineers are the ones who make this happen. Amazing. I just have to say, I was in complete shock when the fans started clearing out at New Era Field. When the lights came on, I was shocked by the amount of garbage all over the stadium floor. I know it can be difficult because of restrictions on what you can bring into the stadium. I used my clear bag to hold my garbage and disposed of it on my way out of the stadium. I felt horrible walking past all the garbage on my way out. It makes me proud to be a fan of a band that takes such strides and cares about making an impact like this. It inspires me to do more. So happy to hear about all the ways the tour is offsetting it's carbon footprint on the world. Walked by The Lucas Oil Stadium yesterday and saw one of the biodiesel trucks there,so saw it first hand.Plan on walking back tonight to see a little show with allot of people. Keep up the good work every body.